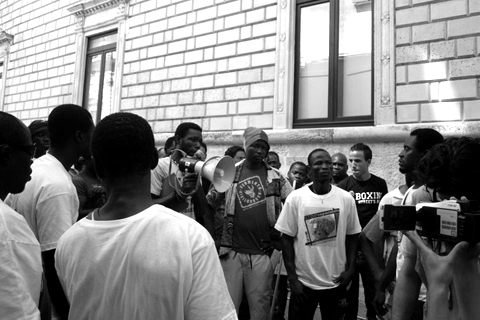 When, in the early dawn of the 30th of July 2011, a group of about 40 African migrants refused to continue harvesting tomatoes on the fields of Nardo (Lecce), nobody would have thought that this would be the beginning of the first self-organised strike of migrant day labourers for better working conditions in Italian agriculture. The group of day labourers refused the demand of the 'caporale' 1 to perform an additional task: to separate the green tomatoes from the valuable red gold, for an average wage of 3.50 Euro per container of 300 kg. The caporale, who had hired the workers, hoped that the workers' concern for their income would make them more cautious, if not submissive – given that the economic crisis has also entered the sphere of agriculture. But he was wrong. The day labourers returned to Masseria Boncuri and erected a street blockade together with some friends, totalling around 60 people. For two years the association Finis Terrae and the Active Solidarity Brigades have organised a tent city on this former farm which accommodates the seasonal agricultural labourers. The day labourers initially arrived hereto harvest watermelons, but they were disappointed that due to low market prices the companies refused to harvest the fruit. They hoped that with the onset of the tomato harvest they would find some days of paid work but they did not accept piece-wages that had dropped to below that of the previous year. This is how the strike started, which was to last for about two weeks and in which, at least during the first days, all migrants from Masseria took part, which was around 350 people. A strike, the impact of which, was to be felt several weeks after it had finished. The 350 day labourers are all men between 20 and 40 years of age, many of them have permission to stay or have applied for asylum. They are from Tunisia, Sudan, West Africa (Benin, Burkina Faso, Ghana, Mali, Togo). Amongst the African workers there are many who had been sacked from factories in Northern Italy and who were looking for an income during the summer months; young students or people who just finished technical college who were looking for a temporary job; refugees who had just arrived in Italy, escaping the war in Libya; young guys from Tunisia who had left the country after the fall of Ben Ali. The majority of them are modern day labourers, who know 'the journey through hell' well enough, meaning that they know the different harvests which happen one after the other throughout Southern Italy: Foggia, Palazzo, San Gervasio, Rosarno, Castelvolturno. At times they combine the work in agriculture with other jobs in industry, construction or logistics. They are 'precariarised' workers in the truest sense of the word. Only a small share actually possesses a permission to stay, the majority is tolerated to stay in the country for humanitarian reasons or are waiting for their refugee status. The migrants without permission to stay are the most vulnerable and are therefore forced to accept the worst wages. This is the common result of the Bossi-Fini legislation 2, which impacts on the general situation, from the factories in the north to the green factories in the south of Italy. Even the activists of those associations, which for two years have supported the campaign "Hire me (officially)! Against illegal employment!" were surprised by the strike in terms of its organisation and dimension. In this corner of the Salento, conditions of the rural labourers had not seemed to have changed much during the last 20 years and were comparable to the conditions in other regions of the Mezzogiorno: during the peak time of the harvests (in Nardo mainly watermelons and tomatoes) the demand for labour is very high. This demand is met mainly by employment of migrant workers, often employed (semi-) illegal and paid at piece-rate. For a few months during harvest in the vast plain of Apulia the demand for labour is particularly high. It is not a coincidence that you find a high concentration of refugee 'reception' centres (centres for custody and identification). Many of the strikers have experiences with these 'reception' centres, which serve as an interface and filter for the labour market. These transitional spaces also serve as a temporary shelter, according to the needs of the labour market. In this way they not only function as 'non-job centres', where you are drilled to accept the lowest wages even before you have actually found a job, but they act as actual compensation chambers? for the labour market. In these disciplinary centres or camps (the names vary) the labour pool takes shape according to the ‘just-in-time’ requirements of industrial enterprises, agriculture and construction sectors. Once the migrant leaves the camp, s/he often looks for work in the surrounding areas, either through friends and relatives or by contacting a caporale. Therefore the centres are important spaces for the labour market, due to their ability to 'regulate' the discharge of migrants according to the needs of the local or regional job market. In this type of agriculture the caporali play the role of mediators between the day labourers and the enterprises, which are often in the stranglehold of the big supermarket-chains.Given that these enterprises have little incentive to mechanise the harvest, they try to reduce labour costs. On the other side there are the day labourers, who are often forced to live in abandoned houses of big 'ghettos', far away from the villages. In Nardo there are six or seven bigger enterprises, each working an area of 600 to 700 hectares, but only ten smaller companies. The bigger enterprises often lease out the harvest. The living conditions of the day labourers in Nardo definitely facilitated the strike: the tent city established in Masseria Boncuri is different from both the model of the 'ghetto' (e.g. the grand ghetto of Rignano, a huge African shanty town half-way between Foggia and Gargano) and from the militarised 'reception' centres, which are banned for 'irregular' migrants (e.g. the 'experimental' centre in Alcamo, Sicily). The daily contact with the Italian voluntary workers has broken the usual isolation and resulted in the migrants knowing about their rights and the statutory wages according to the collective contracts. The conditions in the tent city were definitely precarious and many basically slept out in the open; but "better together here than in the abandoned and isolated farms in Foggia", says Salim from Tunisia, who has worked the whole round of Southern Italian harvests and who knows that the caporali have a relatively easy play? in the abandoned farms to quell any kind of spontaneously emerging demands. The tent city was a space of socialisation, exchange and support during the strike. This was the driving force, but also the limitation of the strike - once, after a few weeks, the caporali managed to undermine the protest 'from within', by using some of 'their men' inside the tent city. Nevertheless the possibility of permanent social relationships in the tent city brought people closer together. An interesting impact of the strike was the overcoming of the separation into different ethnic groups, given that spokespeople were not elected according to nationality, but according to their language skills - in order for them to be able to communicate with as many migrant groups as possible. The common struggle then encouraged further exchange between people, as Mohamed from Sudan says: "Initially people just went to work and then to sleep, without knowing what was happening in the camp. Since the beginning of the strike there is more communication and discussion taking place." The struggles and demands of recent years slowly leave their traces in the memory of this day work-force: the mobilisations of the Maghrebian day labourers in the ghetto of San Nicola Varco (Salerno) in autumn 2006; the two revolts of African citrus pickers in Rosarno in December 2008 and January 2010; the blockading of the roundabouts in Castelvolturno and the surrounding villages (the pick-up places for day labourers) on the 8th of October 2010. In 2008, after the murdering of six Africans by the Camorra, this place had already witnessed angry demonstrations. During recent years, due to the crisis, the queues of day labourers became longer and longer: many workers arrived after having been sacked from the factories in the north and they contributed with their experiences of trade union mobilisations. Most recently the revolts in Northern Africa proved that you can enforce change by struggle: In Nardo there were Tunisians who had arrived in Italy only few months before, and sub-Saharan Africans, who escaped from the conflict in Libya. These were people who had experienced the migrationand economic policies initially in their countries of origin, then in various countries during their migration and finally in Italy (wrongly termed 'reception country'). In particular Libya was a good training camp, many stayed there for months or even years. They worked and tried to avoid the enforced deportation and the worst forms of discrimination. By leaving the country of origin the migrants tried to escape from the de-valorisation process, which they were subjected to in their 'home-countries' for the last 20 years. But they quickly understood, that a mere 'escape' (to vote with one's feet) would not be enough. It is true that – given the lack of a genuine political concept – for many day labourers the main way to improve their conditions is not the struggle, but the individual emancipation from the agro-sector in the south, e.g. by finding better employment in other sectors or other regions. The demands of the striking day labourers were modest: regular employment contracts; recruitment by the local job centre, not through the caporali; the possibility of carrying identity papers with them; more inspections by the authorities; better living conditions. Their main demand was that they should be paid 6 Euro instead of 3.50 Euro for a container of picked tomatoes. At least during its initial stage the protest did not question the piece-rate system, which they see in their favour: given the fact that they are strong they hope that they will earn a day wage which exceeds the hourly fixed wage rate inscribed in the local collective contract. Actually the piece-rate system is beneficial for the employer, because it enables them to calculate exactly the labour costs for each harvest. For the worker on the other hand it means a fast work-pace and in many cases an extension of the working hours, but surely not an increase of the total wage. The demand to increase the piece-rate contradicted the demand for regular employment contracts, but the demand of 'higher wages' hardly turned out to be acceptable for the enterprises, which 'have to survive in the market'. The resistance was particularly fierce amongst the caporali (in Nardo mainly Tunisians and Sudanese). The most determined day labourers, a group of about 30, mounted street blockades with piled-up stones from 3 pm onwards for six consecutive days. These blockades were erected around the camp in order to prevent trucks from coming and going. Both during and after the strike there were many individual and collective cases filed against the caporali: "I was the first to file a case and bring a caporale to the police station", relates Monchef from Tunisia. "He took my identification documents and kept them for eight days, he said he needed them to issue me an employment contract. I never got this contract. And I know that if you don't receive a pay slip, then no contract exists. And when I asked for a pay slip he said that work was finished." This aspect of the struggle touches a central issue; because many caporali, most of all those from Africa, try to disguise their role in the chain of exploitation behind a network of family and community relations with the day labourers, who are often their 'fellow country men' or 'friends'. Many migrants hate the figure of the caporali: "You pay 3 Euro for transport and on the fields they let you pay for sandwich, water or cigarettes", says Abdellah, from Tunisia; but the caporale is able to find work, and therefore it remains a difficult undertaking to break with this relation. It was the actions of the caporale in particular, which contributed to divide the strike front after the first week, while the agricultural enterprises remained in the background. The caporali not only threatened the most active strikers directly and indirectly; they not only hired many strike-breakers from the region around Foggia; they also put a lot of pressure on their 'fellow country men' amongst the workers to return to work and to move to the abandoned farms in the area, in order to circumvent the street blockades around the Masseria. It was mainly migrants without permission to stay who followed their 'advice', given that it was easier to blackmail them and given that they had less hope of geting something out of the strike. On the other hand the caporali gave contracts to some of the workers and in some cases even the payment per container was increased " both early demands of the strike. Enterprises and caporali, who in the end continued to decide and still do decide about the work organisation, managed to re-orientate themselves after the initial confusion the strike had caused " but they also understood that something had changed and that at least for this year they have to accept this fact. After more than one week of strike, arbitration talks started, initially in the prefecture in Lecce, then in the regional administration in Bari. The talks included the strikers, the associations of Masseria Boncuri and the FLAI-CGIL – the only trade union which supported the strike right from the beginning - and important mediators like two regional junior judges. The employers' associations, both those which sat at the negotiation table, such as the Coldiretti, and those which were not present, such as the Cia, simply denied that their associations are in any way responsible for the irregular exploitation, referring solely to the responsibility of the caporali. At the negotiation table a declaration of understanding was signed, which stated the intention to establish enrolment lists for the migrant seasonal workers in the job centre of Nardo. Employers are supposed to chose workers from this list, while the community of Nardo is supposed to guarantee free transport to the fields for the enrolled workers. The aim of both regional administration and CGIL was to work out a model, which could later on be implemented in other harvest regions, such as the Capitanata (area of Foggia) in the coming years. Nearly all day labourers of the Masseria put their name down on the list, but only a few enterprises chose a total of 20 workers and employed them on regular terms. In the meanwhile it had turned into August and the tomato harvest in Nardo was nearly finished. The only concrete result for the struggling migrants was the passing of the legal decree on 12th of August, which pronounced the caporalato to be a punishable offence. This is an important step, and although it won't dissolve the current system in agriculture, it will mitigate its most violent forms. But we think that there are other results, which we should take into consideration in the medium term: migrant workers who were used to hard labour, miserable pay and poor living conditions have tried to change their conditions. They have created levels of communication which were unthinkable only a few weeks before and they have shown that they are more than 'arms'4, just good enough to bring in the harvest. After the events in Rosarno in January 2010 the strike in Nardo confirms that a latent conflict permeates the rural areas of southern Italy, which will surely erupt anew in a different harvest region. The economic crisis, which is a burden on both migrants and 'local' populations, aggravates the conflict. With their strike the day labourers have questioned the consensus that the worst working and living conditions are predestined for the migrants, particularly those from Africa. The struggle seems to have resulted in a clearer consciousness about their own power: we will see which kind of fruits this consciousness will bear during the next season. Of course not only for the African worker. The 'caporalato' is a South Italian mafia-organised system of exploitation. The caporale owns a small truck and drives through the small villages early in the morning in order to look for day labourers, who he then transports to the fields and illegal construction sites. Usually he cashes in between 50 and 60 per cent of the workers' wages. In many cases he 'leases' the harvest from local agricultural enterprises and works for his own account. By now many of the caporali are migrants themselves. The law came into effect in 2003 and aggravated the conditions for migrants considerably and at the same time subjected them to the needs of the market. The right to live in Italy is tied to employment. Whoever is sacked and not able to find work within half a year has to leave the country - even if the person had lived in Italy for years. The permission to stay is limited to one year. After two years of seasonal work the law leaves an option for a three-year permission for seasonal work (the visa is re-issued annually). The fate of the migrants lies in the hands of the employers, which makes it easier to blackmail them. The 'Night of Taranta' is an annual concert in Salento featuring many performers, attended by up to 100,000 people in the audience. The grand ghetto is a place near Foggia, where during harvest times several thousand migrants live spread out in a vast shanty area. The Italian word for day labourers 'bracciante' stems from 'braccia', which means 'arms'.